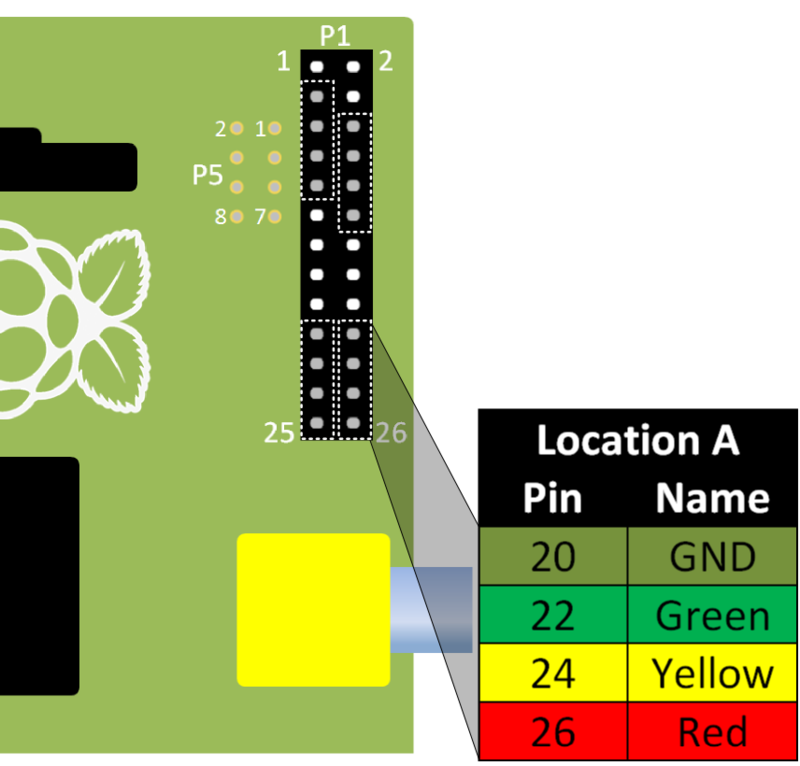 In this guide we will use the Pi-Stop in a game of fast reactions. 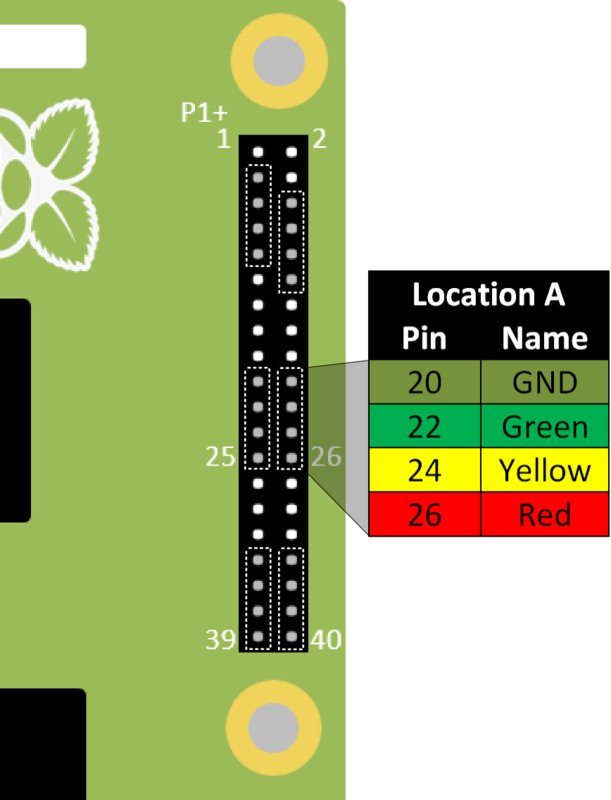 Our program will make the Pi-Stop light up after a random delay, then time how long it takes for us to press the SPACE button on our keyboard in response. The program will also track your best score! Who will be the fastest person in the workshop? We will break the game down into smaller sections so we can build it up piece by piece. 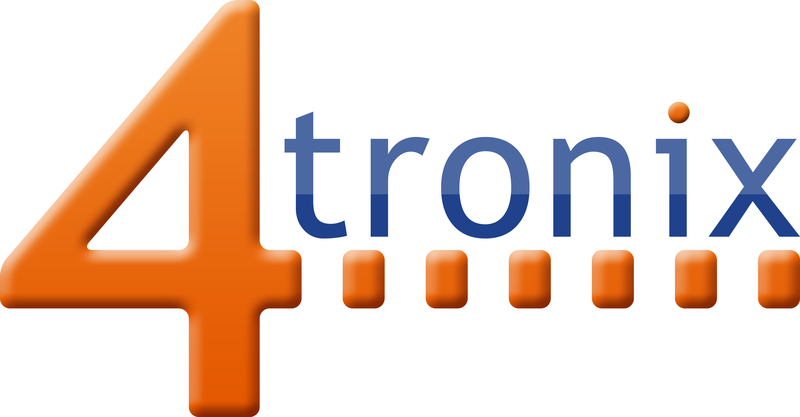 Setup and Wait for user – Ensure the player and game is ready. Start the game – Switch OFF the lights and see how long the player takes. Work out the scores! – Workout the player’s reaction time. Who is the fastest? – See if the player is the fastest. Next round! – Give the player another go. 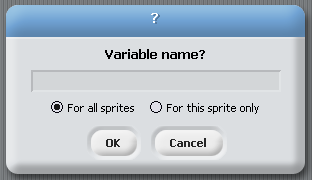 Add a new variable by pressing the “Make a variable” button in the Variables tab. 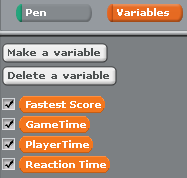 Create a new variable Fastest Score, set it to be For all sprites. This will create a new item in the Variables tab. NOTE: The tick next to it controls if it is displayed on in the main Scratch window. For this game, it doesn’t matter if they are visible so you can leave them ticked. We will also setup some broadcast group blocks as before, to control our lights. We just need an ALLON and an ALLOFF broadcast group block to switch ON or OFF the lights. The game should wait for the use to press a key (for example the UP ARROW key). NOTE: GO will be a broadcast group block which runs the game (see the next section). 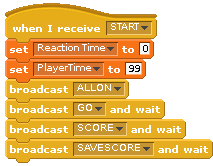 We have to use a broadcast “GO” and wait block, otherwise Scratch will continue on and try to work out the scores before the player has had chance to play the game. The wait part ensures this block is finished before moving onto the next block. We will measure the players reactions by counting the time the user takes to press the SPACE key and compare it with the time the LEDs go out! The key part here is the pick random 1 to 5 to provide a unknown wait time before we switch OFF the lights. 3. Work out the scores! After the game round has finished, we will need to work out the scores. 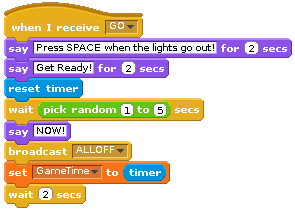 We will have the time the player pressed the SPACE key (the “PlayerTime”) verses the time the lights switched OFF (the “GameTime”). By checking if the “PlayerTime” is shorter than the “GameTime”, we will know they pressed too soon (case 3). If that happens, we should tell them (so they know to wait next time “Too Fast!”) and give them a very bad score for not waiting/cheating! 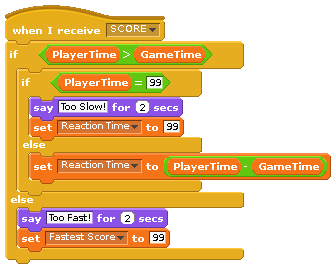 If the “PlayerTime” is equal to its initial value than the player didn’t press the SPACE key at all. Again, we will tell them “Too Slow!” and give them a bad score. If the “PlayerTime” is longer than the “GameTime”, they have pressed the SPACE key after the lights switched OFF. Their score will be the difference between the “GameTime” and the “PlayerTime”, their “Reaction Time”! We add another broadcast and wait block (to run our new “SCORE” block) to the main “START” broadcast group block. 4. Who is the fastest? Next we work out if the “Reaction Time”* faster than the “Fastest Score”, if it is we can set a new “Fastest Score”. Finally, we tell the player “Press UP arrow to START” and restart (without resetting the “Fastest Score”). 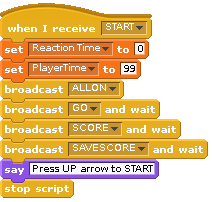 NOTE: This block will restart as soon as the player presses the UP arrow. By breaking our game into smaller tasks, it was a lot easier to make! 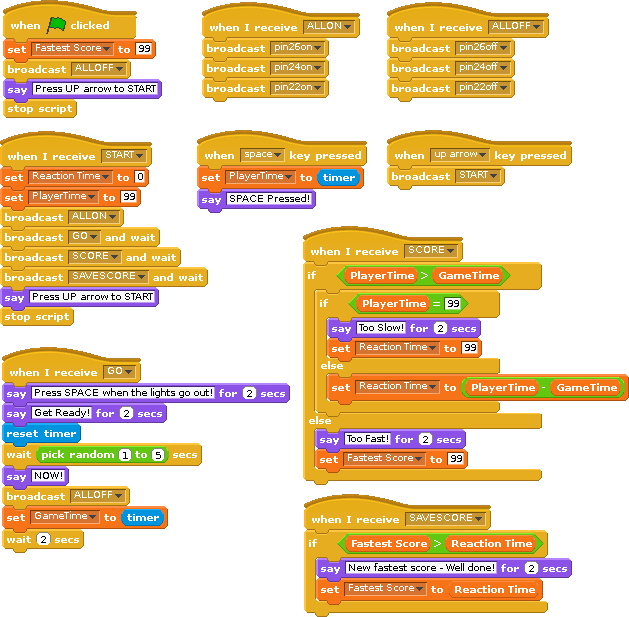 Amazing, you have created your first game in Scratch! WORKSHEET: Tick the checkbox marked “I’ve created the Pi-Stop Reaction Game”. Don’t forget to write down your best score! Can you make this game more challenging? Try making this game more difficult by randomly picking a different LED each time, and make the player will need to select the correct LED (1, 2 or 3) in order to score!